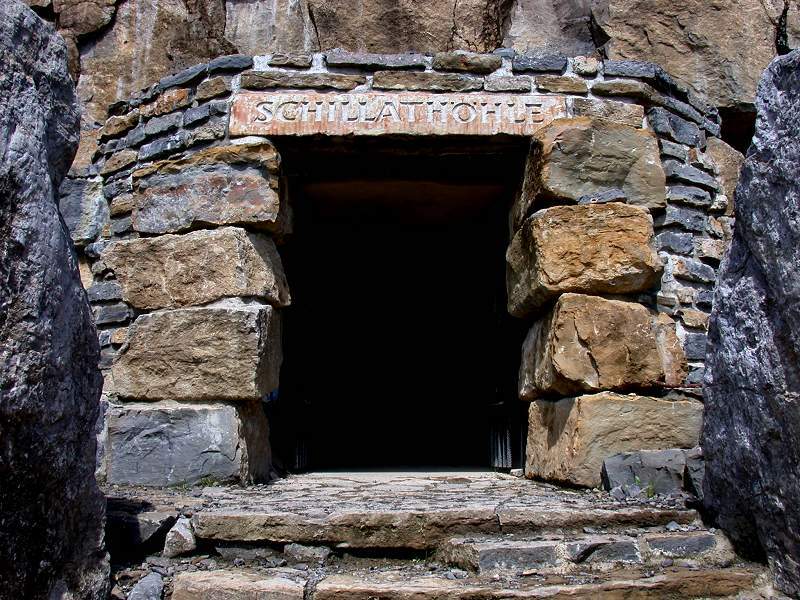 Image: the entrance to the Schillathöhle. Location: Near Hessisch Oldendorf, in the Steinbruch Segelhorst (Segelhorst Quarry). A2 exit Rehren, turn left towards Hessisch Oldendorf, under the motorway, turn left towards Bad Nenndorf. After 3km at Hattendorf turn right to Langenfeld, through the village towards Segelhorst, 500m behind the city limits. Signposted. Open: APR to OCT Wed 14-17, Sat, Sun, Hol 10-17. NOV to MAR Sat, Sun, Hol 10-17. Groups all year after appointment. Fee: Adults EUR 6, Children (6-18) EUR 3, Disabled EUR 3. Guided tours: L=180m, V=34,000/a . 1992 discovered by Hartmut Brepohl during quarry works. 1999 nature protection rules loosened to allow the development of the cave. 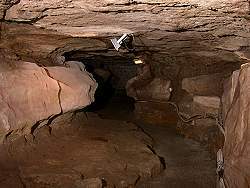 The Schillathöhle (Schillat Cave) is one of several caves in the mountain ridge called Süntel, in the northern Weserbergland. The typical rocks here are oolitic limestone from the Oxfordian (Upper Jurassic, Malm). This stage is locally called Korallenooloith (corall oolite) and is most important for both, quarrying and caves. 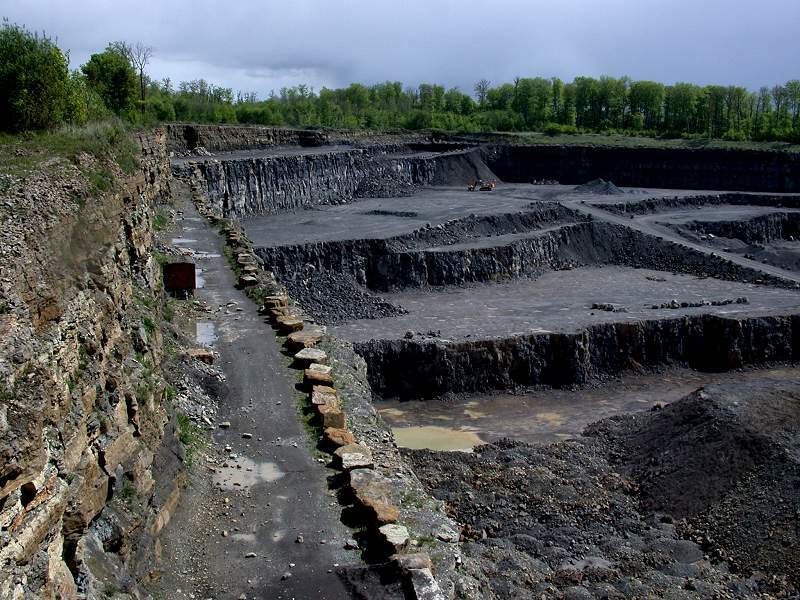 Here at the quarry Segelhorst it is quarried by the Norddeutsche Naturstein GmbH. 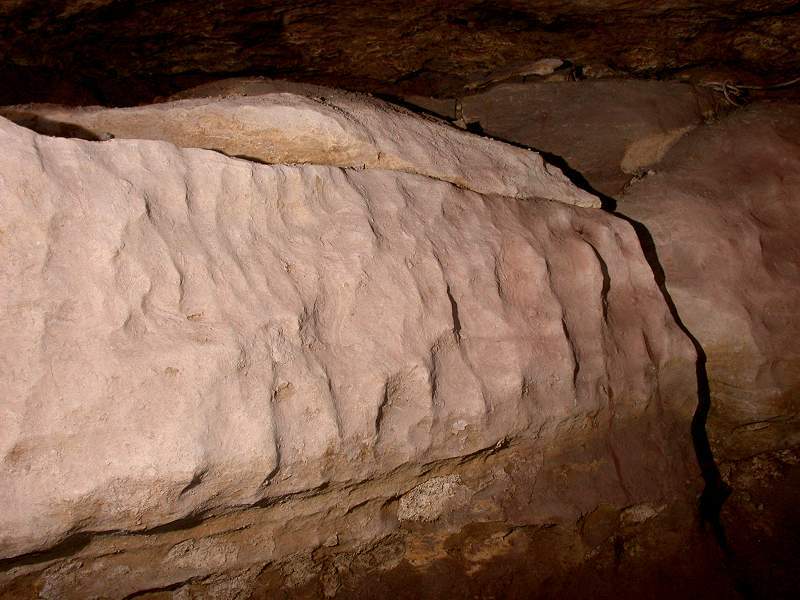 In their limestone quarries, now and then caves are found, like the Schillathöhle or the Riesenberghöhle. 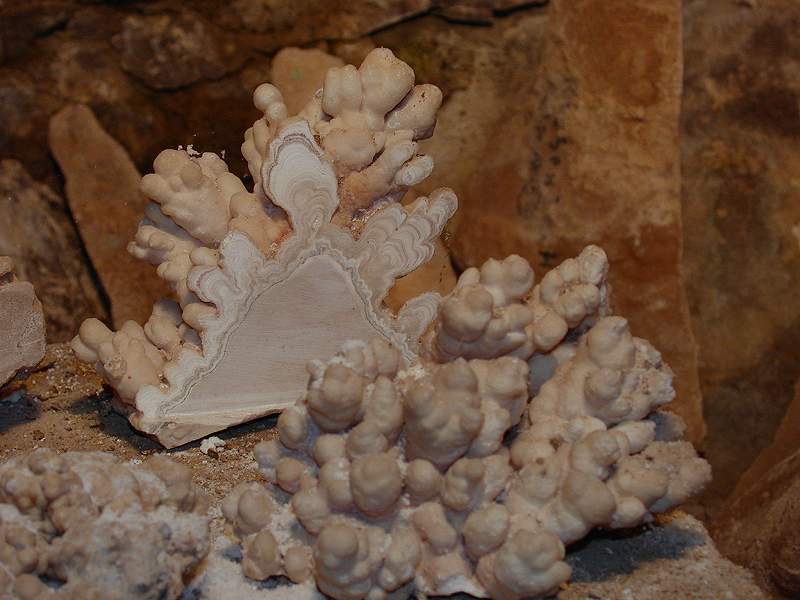 Image: the exhibition with calcite minerals. The Schillathöhle was named after Bodo Schillat, a speleologist of the Höhlengruppe Nord and discoverer of the famous Riesenberghöhle. 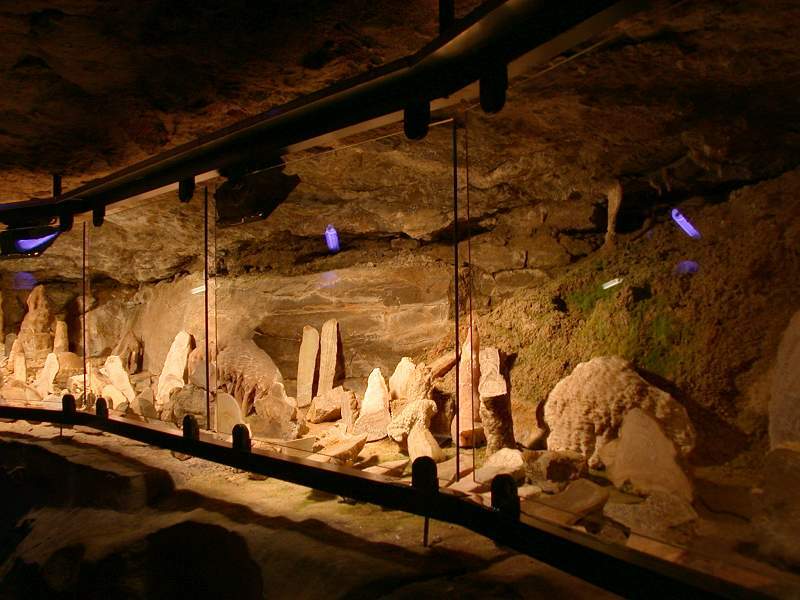 The Riesenberghöhle is one of the biggest caves of Niedersachsen and about 1,100m long. It has extraordinary formations, but unfortunately they are rather fragile. Because of this, this cave is protected and a development for the public is impossible. But on the other hand there is a huge demand for a public cave in this part of Germany, as there are no other show caves. 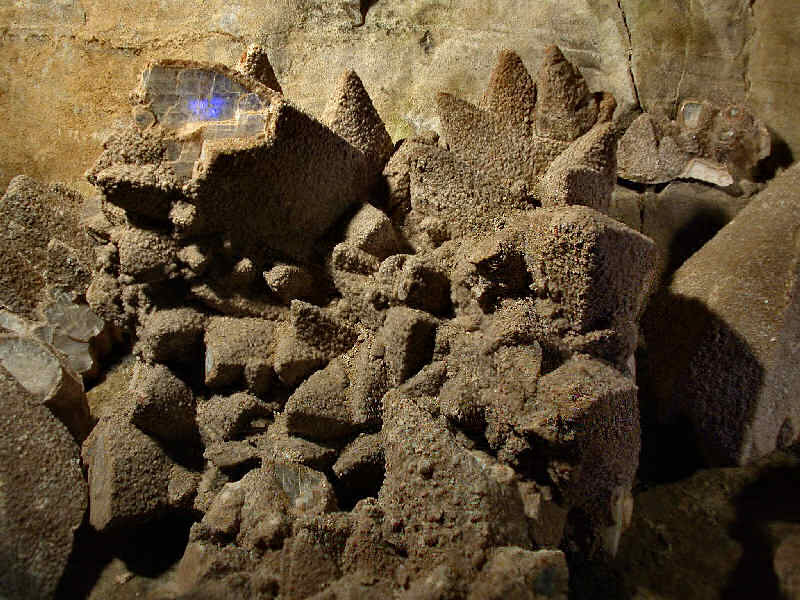 So the persons in charge decided to develop the smaller Schillathöhle to allow the public to see a local cave, which on the other hand reduced pressure on the opening of the more fragile Riesenberghöhle. This strategy was even supported by the local environmentalist party, the Fraktion der Grünen Hessisch Oldendorf. 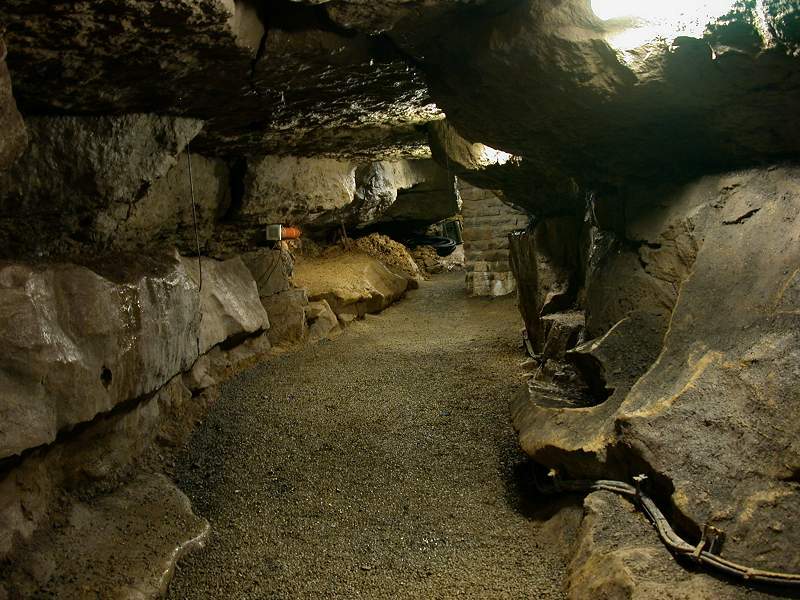 During several years of development work by the future cave administration and the caving club Höhlengruppe Nord, the main passage was equipped with light and concrete paths. When leaving Langenfeld towards Segelhorst, there is a new parking lot, and after 200m walk the unimpressive new entrance building. But after entering this building, the view down into the quarry is really impressive. All visitors are equipped with helmets, a tradition of show mines, which is rather uncommon for a show cave. An elevator accomplishes the vertical transportation needs of the visitors to the 45m deeper level of the cave. The cave passage which the visitors now enter, is completely without speleothems, as it is a now dry river passage. There are the remains of flowing water, including solution pits and erosional forms in the rock. 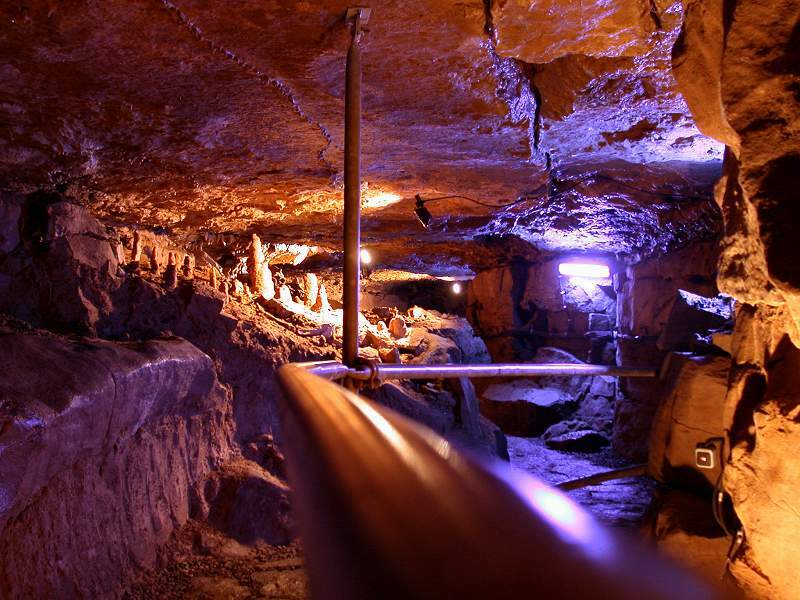 More than half of the once 400m long cave was destroyed by the quarrying of the limestone. There are two remaining parts, which are not connected any more. An artificial connection was constructed to protected the visitors from falling rocks from the quarry walls above. 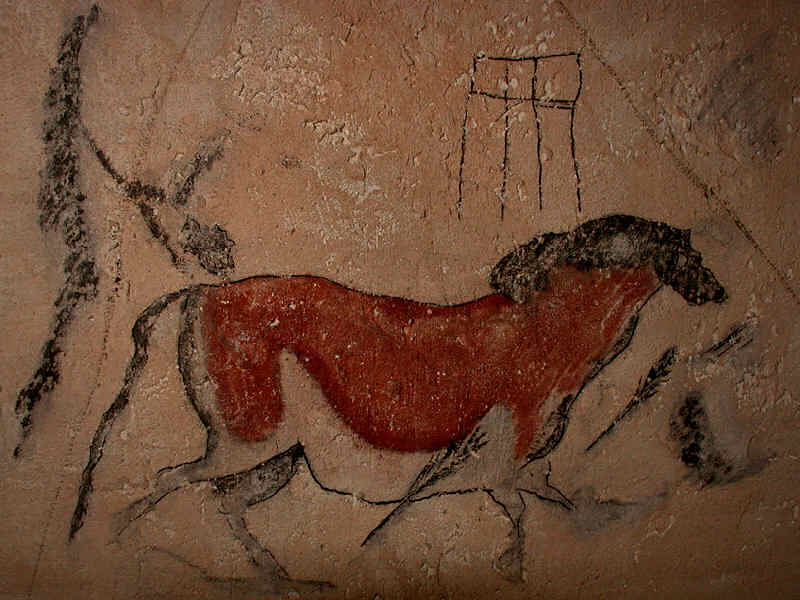 It is made of a concrete tube, the outside covered by natural rocks, but the inside painted with cave paintings in the habit of the Grotte de Lascaux (France) by students of the Kunsthochschule Hildesheim. In this tube is an exit to the quarry floor, which is the first stop of the tour. It gives the guide the chance to explain a bit about the time the rocks were deposited. There are ripple marks on the rocks, which show the sedimentary origin. The high walls above with the entrance building and the elevator tower above are impressive. Now we enter the cave. A cave which is really ordinary, if not to say boring, at least for the average visitor. It seems, the only reason to develop this cave was really the lack of any other show cave in the area. And as the management was aware of this, they decided to spice it up by adding a rather huge exhibition inside this cave. 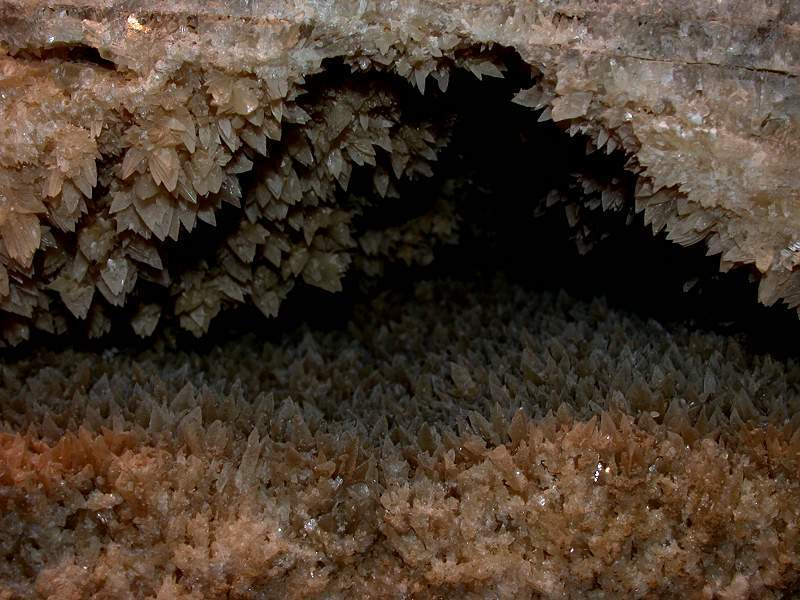 First there is a collection of speleothems, and calcite crystals, cave pearls and cave coral relocated from other caves of the area. Many of this exhibits were a result of the quarrying, and the caves they were found in are completely destroyed. A second part of the exhibition is dedicated to fossils from the Jurassic, ammonites, belemnites and echinites. Plastic models show how those once looked like. The third part of the exibit shows minerals of the area, which are not connected with Jurassic limestones. There are different rocks around with some interesting ores and crystals. Thus detracted from the boring cave the visitor reaches the last part of the cave, which does contain some speleothems. They are really small and unspectactular, even for German means, and thus some fancy legends are told about them. 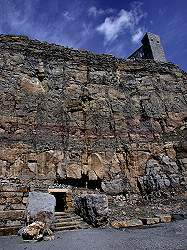 For example there is the story of a bad guy who was banned into the cave and petrified here. A pair of stalagmites is said to be his legs. As there is only one passage the tour returns the same way, through the exhibitions and the artificial tunnel to the elevater. Behind the elevator there is the opposite end of the cave, which is equipped with seats and a slide projector. 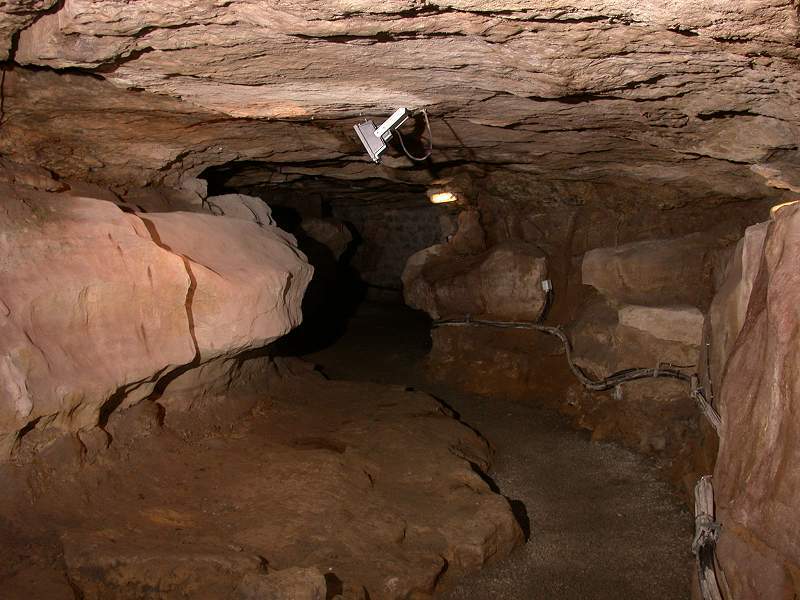 A 3D slide show takes the cave visitors on a virtual tour through the closed Riesenberghöhle. The photographs were made by Franz Miller from south Germany and David Stuckey from Sydney, Australia. This is probably the most impressive part of the tour.